Solutions are when two or more items or ingredients will completely mix together and won't be able tell them apart. However, a mixture is when two or more items and or ingredients are mixed together but you can still tell them apart. Try this: Mix water with an oil. Mix with a spoon or if you are using a jar, shake. Wait to see what happens. 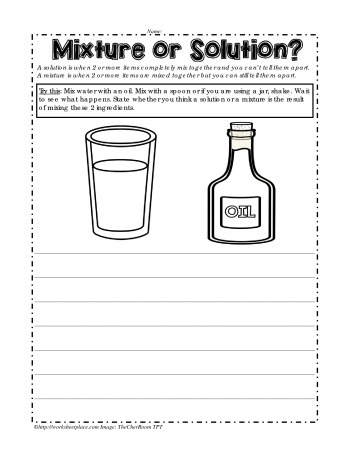 State whether you think a solution or a mixture is the result of mixing these 2 ingredients.